An Epidemic in the U.S. 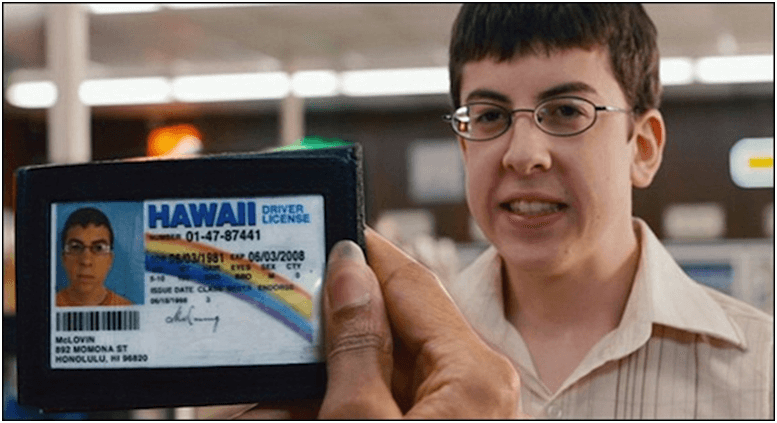 If you’re an American, chances are you’ve had at least one alcoholic beverage while under the age of 21, which is the current legal drinking age in the United States. Shockingly, studies have shown 13 is the average age for children who experiment with alcohol between the ages of 12 and 17, and age 16 the average for children between ages 12 and 20. This could very well be the reason college student’s abuse alcohol so frequently in the United States. It’s literally glamorized by the media and condemned by most responsible parents and adults, thus it makes perfect sense as to why our youth develop a dependency on alcohol before they even graduate High School. Psychologist and DWI Counselor Dmitri Oster told us during an interview that society is putting more of an emphasis on other narcotic epidemics, so drinking goes without much notice or punishment. So now you’ve reached the legal drinking age and all your worries of getting into trouble with the law are over, right…? WRONG! Driving while intoxicated is another epidemic surrounding alcohol in America which can lead to automobile accidents, arrests, injuries, or even worse, deaths. Every time you get behind the wheel and your sobriety is in question, not only are you putting your own life in danger, you’re also putting passenger’s, pedestrian’s, and other motorist’s lives needlessly at risk. But, how do you know when you’ve had too much to drink?DUI Lawyer Bret Metcalf told us that many DUI cases result from people getting pulled over for small traffic violations like headlights, blinkers and other unrelated offenses. What is your B.A.C. Level? B.A.C. stands for your Blood Alcohol Content. 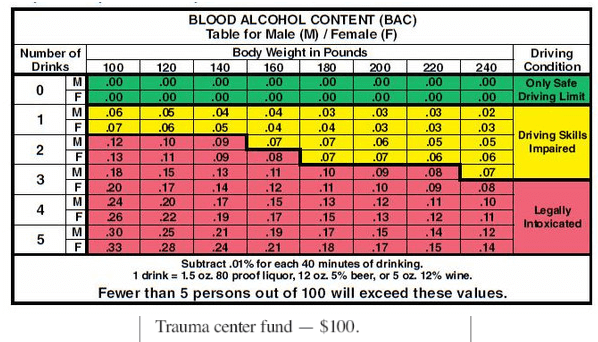 This is simply a way to measure the amount of alcohol that’s in your bloodstream after consumption. The legal B.A.C. level in the U.S. is .08% and lower. A good rule of thumb is; for everyone alcoholic beverage you consume, it takes about anhour for your B.A.C. level to go back to .00%. On average it takes about two and a half alcoholic beverages to bring you close to the legal limit. This is not a full proof method though because of many different variables, including genetics, will contribute to raising your B.A.C. level. Variables Which Affect Your B.A.C. So the next time you’re proud about drinking your buddy under the table, remember you may have just been born with that “advantage”. Your “advantage” can come back to bite you big time if you fail to proceed with caution. Feeling capable of driving and BEING capable of driving are two completely different realities. If you have any doubt at all about getting behind the wheel, save yourself a lot of time, stress, and money by calling a cab. It ends up being far less expensive considering the alternative consequences. One thing I was shocked to learn is a person can still lose their license while blowing below the legal limit of .08%. D.U.I. (Driving Under the Influence) has been replaced with O.V.I. (Operating a Vehicle Impaired). One major reasons for this change was so citizens can be charged for operating any vehicle, including those without motors. The second reason is so they can convict you of this offense, even if you’ve had no alcohol whatsoever. An influence of any mind-altering substance, including cough syrup and prescription medications is enough to put you behind bars. Their reason for this minor adjustment, you guessed it, money! Every time you get behind the wheel impaired, not only do you risk killing yourself and those around you. You’re also risking your freedom and your financial security. 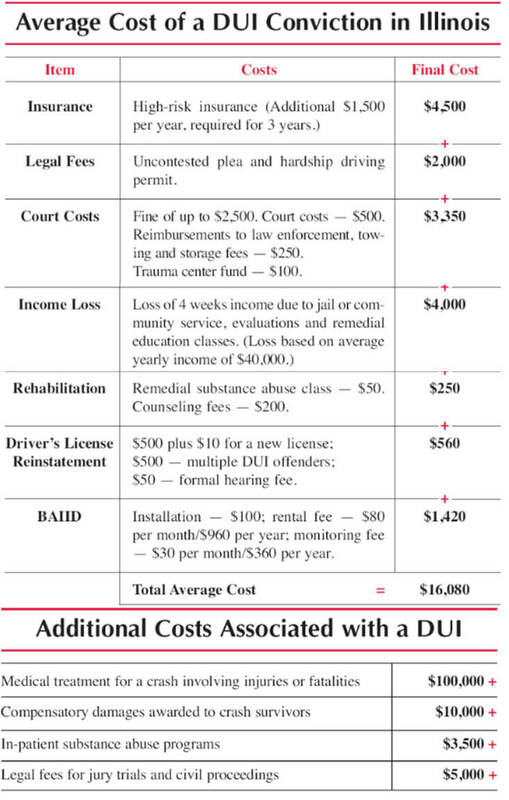 As you can see from this chart, an OVI/DUI is more than enough to put you in financial ruin for a very long time, totaling in at just under $135,000. You can save yourself a ton of misery by doing the wise thing and giving up your keys to a sober designated driver. If the person who’s driving your vehicle is also intoxicated, I promise things will end up being just as bad as if you had been behind the wheel. The difference… you’ll have a friend to share the awful experience with. Yes, I’m speaking from experience, and please trust me, it’s not worth a few hours of fun.